Interdisciplinary science meets art. Elpida Georgiou returns to the art world with a brand new series of oil paintings based on famous Shakespearean characters and inspired by psychoanalysis. 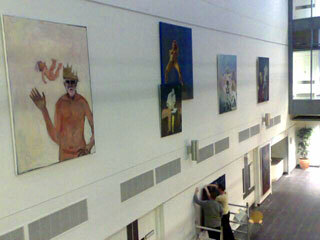 The series of twelve large oil paintings were developed at King’s College academic environment that hosted two years of research. While studying literature, using psychoanalytic models and oil paint, Elpida managed to bridge the gap between science and art. The final result is an exhibition at the Institute of Psychiatry, close to Denmark Hill and opens on Thursday 20th of November. Shakespeare Dreams: Death & Desire ends Saturday, 31st of January 2009. Two years ago artist Elpida proposed to explore the conjunctions of Shakespearean drama and psychoanalytic models, ancient and modern, in a series of twelve paintings. She was awarded a scholarship from the prestigious Leverhulme Trust and became an artist in residence. The English Department at King`s is one of the oldest in the country and its strengths in the study of literature from socio-historical perspectives have long been recognised. The Institute of Psychiatry is a postgraduate institute and school of King’s College, it is the only postgraduate institution in the United Kingdom devoted to the study and practice of psychiatry and related disciplines. In this unusual interdisciplinary context Elpida approached her project. During a studio visit, Professor McMullan, who was impressed by the Lear painting asked Elpida how she managed to translate text into pictures.“What I do is paint, the painter’s creative process is often intuitive”. Elpida reveals that the researcher is still an artist sharing a love for literature and psychology with her professors and her students. She used psychoanalytic models on the likes of King Lear and Lady Macbeth for inspiration. “My approach to Shakespeare’s plays is that I do not consider my role to be that of an illustrator depicting specific scenes, but to attempt to capture the dramatic essences of the author’s works.” In other words behaviour is character. With respect to all science, good art means drama. The artist, previously trained Central Saint Martins College of Art and Design and the Royal Academy has been awarded the Guinness prize for her earlier work. Not only scientist and artists, but Britons in general will love these works that were inspired by their most famous dramatist. The following Shakespearean paintings are on show : King Lear, Macbeth (two works), A Midsummer Night’s Dream,Titus Andronicus, Hamlet, The Tempest, Julius Caesar, The Winter’s Tale, Coriolanus, Othello and Richard III. Copyright © 2017 Real Art First by Elpida. All Rights Reserved.